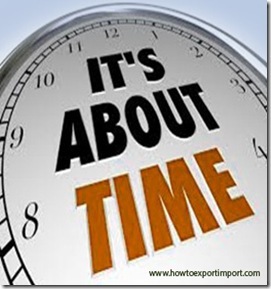 Why should Certificate of Origin – GSP – date be before shipment date? Can BL date be after GSP date? Can GSP and BL date be on same day? GSP means, Generalized System of Preference, which is issued by Export Inspection Councils. Export Inspection Agency has offices in all major cities to serve exporters in maintaining best quality to meet the specification of buyer to have best quality management system for exporters. In order to get certificate of origin (GSP), before physical movement of goods for exports, you need to apply with export inspection agency as per their specified request form along with copy of commercial invoice duly signed by the authorized signatory. After verifying properly and collecting necessary charges, export inspection agency certifies the document and issues GSP Certificate of origin along with attested copy of commercial invoices. We could not arrange to release Certificate of Origin before shipping of export goods. Can we arrange Certificate of Origin – GSP - after export of goods? Does GSP certificate of origin issues after shipment? Have you satisfied this article - Can Bill of Lading (BL) is before date of Certificate of origin GSP? Would you like to share your experience in handling GSP certificate of origin after Shipment Date? Do you wish to add more information about this subject - Can Bill of Lading (BL) is before date of Certificate of origin GSP? Do you have different thought about date of certificate of origin and date of shipment/ Date of Bill of Lading? Share your experience below about date of certificate of origin and date of BL/AWB. Discuss below your thoughts on this article - Can Bill of Lading (BL) is before date of Certificate of origin GSP? Rajeevan Patteri: On 25 April 2013 Sir, I have some questions about Invoice Date. Normally, we are preparing two types of Invoices for Exports : one is for Pre-shipment i.e Customs Clearance Purpose and other one is for Post-shipment purpose. Pre-shipment Invoice date is always before the Customs Clearance and it is the only record with Customs. After we receive the B/L we also prepare another Invoice by adding the B/L No. & Date for getting COO and other post-shipment certificates. So my question is what will be DATE in post-shipment Invoice. Also in future, if need to submit the Invoice and Packing List to Customs for any query raised by Customs, which Invoice we need to submit whether Pre-shipment Invoice or Post-shipment Invoice. I have noticed some of the Import Documents i.e most of the certificates are carrying Pre-shipment Invoice Number and Date as well as Post-shipment Invoice number and dates, I meant to say that there is no uniformity in Invoice Number and Date, and importer gets confused by checking the import documents. Awaiting for your valuable reply. surendran: On 26 April 2013 Hi Rajeevan, As per my experience, we do not mention two dates in one invoice. Let pre shipment or post shipment, once after issuing a commercial invoice, let the date of invoice be same for all future reference under same shipment. Absolutely no problem, if you mention same date on preshipment documentation and post shipment documentation. So please go ahead by mentioning one invoice date where in no confuse whoever handling - internal office, bank,buyer,customs or any other agencies. Cheers! Gaurav: On 03 September 2013 Hello Sir, I am a student..first of all thanks for this blog..i find it to be one of the most informative blogs on import/export..i have some doubts 1. the terms 'GSP Certificate of origin' and 'Certificate of origin'...how are they different 2. GSP Certificate of origin can only be issued after the Commercial Invoice has been made...i.e.the goods have been packed..how does the Export Inspection Council then Inspect the goods? or does it issue the GSP without inspecting.. 3. the EPCs can issue a certificate of origin too..what all documents are required for this and when can it be issued... Awaiting your valuable response. sridhar iyer: On 10 November 2013 I wish to point out that Export inspection Agency has the Moral responsibilitity (if not moral) to project India's Qality. However they use the most inferior quality of paper for issue o COO and many times the COO forms get mutilated at the hands of the EIA Staff, putting the Exproters into great trouble and forcing them to re-submit their COO applications. Besides this, they have system of On Line appplication while their server is seldom working and is accessible to the Exporters. Unlike other Government Departments the EIA staff themselves either are not adeqauately conversant with the requirements /or maintain a vary casual attitude due to which any exporter who may face troule in logging in for the COO application, is unable to get any help from the EIA and no proper guidelines are provided to the Exporters about the procedures. Surendran Kollerath: On 08 March 2014 Hi Rakesh Agarwal, As per my knowledge, EIA staff need not physically verify export goods before issuing Certificate of Origin. However, in certain goods, EIA is authorized to examine goods before export takes palce. Ali: On 20 October 2014 I have an issue, please see the example that what I am having, GSP form has date of 3/Oct/2014 and BL is dated 29/Sep/2014, Customs raised issue and saying GSP must be dated before BL, now what should we do, either to give them new GSP or any other possible solution, please update.